• None of the defence motions were sustained, and the defendant was handcuffed in the courtroom. 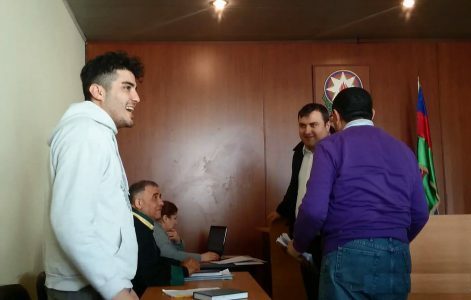 Surakhani District Court held a hearing on Nasimi District Police Department chief Musa Musayev’s private prosecution complaint against Mehman Huseynov. The hearing was attended by Mehman Huseynov, his lawyer Elchin Sadigov and the private prosecutor’s lawyer Alirza Habilov. Replying to the defence’s argument from the previous hearing regarding Mehman Huseynov’s lack of an identity card, the judge said the court had received Mehman Huseynov’s photo and basic information from the portal of the Ministry of Internal Affairs (MIA). He went on to read Mehman Huseynov’s personal information and asked the defendant whether he confirmed it. Mehman Huseynov responded that he had neither an identity card nor another document. The judge said Huseynov had the right to appeal to the court if the MIA was refusing to issue him an identity card. Huseynov stressed that they had already appealed to court several times, to no avail. After that, private prosecutor’s lawyer Alirza Habilov was given the floor. He noted that Mehman Huseynov was detained on 9 January 2016 over an administrative offence, a protocol was drawn up and Huseynov was brought before the court. “The court found him guilty of resisting the police under the Administrative Offences Code and imposed an AZN-200 fine on him. After being released, Mehman Huseynov gave an interview to the media that had gathered in front of the court building and noted that he had been kidnapped by the police and subjected to torture. Baku City Prosecutor’s Office has conducted an investigation in this regard and his claim did not prove true. We have filed a complaint with the court over his libellous allegations that have undermined the reputation of Nasimi District Police Department headed by private prosecutor Musa Musayev. We are requesting that he be punished in line with Article 147.2 (libel, involving an accusation of a serious crime) of the Criminal Code,” Habilov said. Next, Mehman Huseynov was invited to speak. The defendant said the charges against him were groundless and he had been sued on the instructions ‘from above’. Mehman said he had known he was going to be arrested since December. “In December 2016, I saw a police officer keeping an eye on me when I was in a barbershop. As I had known him beforehand, I anticipated a provocation. When I left the barbershop, a man hit me with his shoulder in the street and tried to provoke me. I ignored him and went away. I later learned that their purpose was to arrest me and sentence me to several days in jail so that I spent the New Year’s Eve in jail. After that, I did not leave home for several days. A policeman, who is a friend of my acquaintance, sent me a message that a provocation was being plotted against me and advised me to not walk alone. So I did. On 9 January, I was with four people. When I walked away from them talking on the phone, 7-8 plainclothesmen approached me, brutally pushed me to the ground, shoved me into a car and put a bag over my head. Everything happened before the eyes of 30-40 people who were nearby, in addition to those who I was with. After driving around the city for a while, they brought me to one place but did not take the bag off my head. Both along the way and in the place where I was taken to, they held my head down, with a bag over my head and my mouth covered. At the Department, one of them lay on top of me, tormenting me even more. They filmed me in an insulting manner and laughed. Afterwards, they took the bag off my head. I recognised two of those who were in the room. I knew that they were working for the 22nd police station of Nasimi District Police Department because one of them had previously participated in the arrest of my brother Emin Huseynov. They openly told me that I was detained because of my activity. I fainted at the police office. I have a venous thrombus in my leg, and none of the hospitals admit me for surgery because I have not had any document for a long time. Due to that problem, I had a leg seizure. They called an ambulance. Then, they took me to another room and began to insult me. They even slapped me a couple of times. Doctors came and gave me an injection of some unknown drug. In that unconscious state, they had me sign some documents. Even the judge was shocked when looking at those documents, by how different the signatures were. Even the doctors of the first aid station told the policemen ‘why have you done this to a regular citizen’,” Mehman Huseynov said. Mehman Huseynov added that he had been taken to Nasimi District Court the next day at 11 am. “I was accompanied by 4 policemen wearing uniforms. They stayed with me for several hours. They were telling me ‘Mehman, we do not know why they have brought you here’. But in court, they came and framed me saying that I had allegedly violated the public order in the street and disobeyed the lawful demand of the police,” Huseynov noted. The defendant added that after being fined AZN 200 by the court, he spoke to the journalists about what had happened. “I have not yet spoken of everything that happened there. Everything I said has occurred. I am not crazy enough to make up all these things,” he said. Huseynov noted that everything that had happened in the police department had been recorded by the cameras in the room. “Alirza Abilov introduced Musa Musayev in such a way as if he is not the police chief, but the god of Nasimi district. They treat people like animals in that department. Personally, I was treated in that way. I am not slandering anyone. On the contrary, I am being slandered. I know that this lawsuit is related to my activity. I should note that nothing can deter me from my activities. I do not agree with the charges, but I am not afraid, either. I couldn’t care less about the decision that will be issued. They saw that I was exposing them, and decided to punish me this way,” Huseynov said. He then answered his lawyer Elchin Sadigov’s questions. He said he had no malice or hatred towards the police. Next, private prosecutor’s representative Alirza Habilov spoke in defence of the complaint to substantiate it. “None of Mehman Huseynov’s allegations proved true during the investigations or in court decisions. There are effective decisions in this connection. By claiming that the officers of Nasimi District Police Department kidnapped him, put a bag over his head and beat him in the department, Mehman Huseynov has discredited the police chief before the minister and the head of state he is subordinate to. Therefore, we request that he be sentenced to three years in jail,” Habilov noted. Then, lawyer Elchin Sadigov filed motions to question the four people who had seen Mehman Huseynov’s detention as a witness in court, to determine the identity of the deputy chief of the criminal investigation division of Baku City Main Police Department who had been in charge of the operation and to invite him to court, to question neighbourhood police officer Kangarli who had drawn up the protocol at the police department as a witness, to obtain the January 9 recordings of the cameras located in Nasimi District Police Department, and to ensure that Musa Musayev come and testify in court. Private prosecutor’s representative Alirza Habilov asked for the motions to be rejected. The judge did not grant the motions. The judge said such a rankings table did not exist. “What I want to say is that a police department cannot have a reputation. Reputation exists between competing entities,” Sadigov replied. After that, the judge proposed to complete the judicial investigation. The Private prosecutor’s representative Alirza Habilov did not object. However, lawyer Elchin Sadigov said it was important to interrogate the private prosecutor, Police Chief Musa Musayev, and filed another motion to summon him. The judge denied the motion and announced the completion of the judicial investigation. He gave the floor to private prosecutor’s representative Alirza Habilov. Habilov defended the lawsuit and requested the imposition of a 3-year jail sentence as recommended by them. After that, the defence was given the floor for closing arguments. Lawyer Elchin Sadigov said he needed to put together a large speech and requested a week to prepare it. The judge said he could give Sadigov 30 minutes and announced a break. After 10 minutes, the judge returned and resumed the hearing. Forced to make his speech, Elchin Sadigov asked for his client’s acquittal. In his final speech, Mehman Huseynov said he was ready for any decision. “Whatever has been ordered from above will happen. I have not committed any crime. The trial was not conducted in a normal way, which is proof of an order [from above]. This is directly aimed at stifling the freedom of speech,” Huseynov said. After a two-minute deliberation, the judge announced the judgment, according to which, Mehman Huseynov was sentenced to 2 years in jail. Mehman Huseynov, the founder and manager of the Facebook page Sancaq (https://www.facebook.com/Sancaq.biz/?fref=nf) having 323,000 followers, has recently been producing videos on senior officials’ and parliamentarians’ expensive properties. He has also been making videos on important socio-political processes taking place in the country. Huseynov’s latest video was a street poll related to first lady Mehriban Aliyeva’s appointment as first vice president by President Ilham Aliyev. The question he asked to the respondents was ‘would you give your wife a post if you were in charge’. subjection to torture including physical pain and mental suffering, in order to deceive the public and to undermine the reputation of the police. “The Ministry of Internal Affairs has filed a petition with the Prosecutor General’s Office of the country to give a legal assessment of Mehman Huseynov’s act of slandering the police by accusing them of a serious crime. Additional information on the results of the investigation will be published,” the Ministry’s statement read. Mehman Huseynov says he has undergone a medical examination in connection with his harassment and injuries sustained. “We filed a complaint with Baku City Prosecutor’s Office due to the tortures inflicted on me, but the prosecutor’s office declined to launch a criminal case in this connection,” Huseynov added.